Our high quality services and technical expertise have strengthened agricultural and rural markets in all corners of the world since 2007. The 2019 conference will take place Oct. 14-15 in Dakar, Senegal, bringing together development professionals and private sector experts to discuss market systems, food security, nutrition, finance and more! 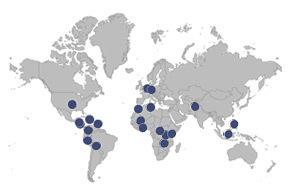 Connexus has a diverse range of projects around the world. Learn more about our current and past work.